Please be kind - this is my first post. It is 11.5cm capped,10.5 uncapped. The experts need pictures. 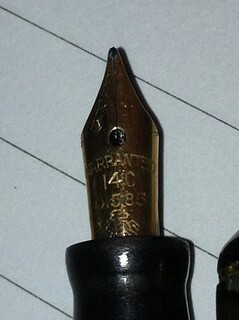 Close up of the nib and the clip. 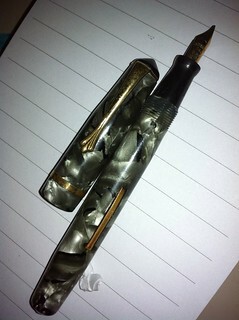 After WW2 - 1954 Waterman broke down in the US and closed it's US factories....had one still in France. Waterman -England took over the Falcon Pen Works in Neasden, London, making the Pitman-Shorthand pen, the Unique and under the Waterman name Boots. 1946 moved the firm to Finsbury Park, London, and made the same pens as in America. After the break down of the main firm, it is thought that Waterman pens were made by the Firm Stephens, a company from the '30's. 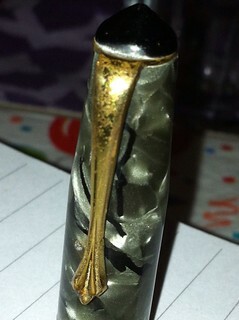 It is thought Waterman made pens in UK into the '70's. Info from Fountain pens by Andreas Lambrou. A photo will certainly help. Unique made many models of pens from 1924 to 1958. Late forties/early fifties, I would say. That pointed clip stud doesn't appear on the ones I would think of as later. Though the last of Unique's output was poor quality, that looks like a decent pen. Some nice Uniques do turn up, I'd be inclined to agree with with the above date wise , I'd regard them as a lower to middle second tier brand. I agree with Deborah, although I would go as far as the mid fifties. As far as I know Unique didn't have any relationship with Waterman's although, they contracted pens to be made by third parties, when it suited them. What Lambrou might have been alluding to was that Waterman's were bought by Stephens and subsequently the Royal Sovereign Group. As far as I know Stephens were never actually a manufacturer. They bought their pens in, principally from Langs, and later imported them from France. These were quite probably manufactured by Waterman's of France. Edited by peterg, 05 September 2017 - 16:18. Unique seems to be a brand that is increasing in value / desirability; in 2012 they were somewhere below Platignum in the ebay pecking order, yet today they seem to attract very respectable prices. You wonder how these old threads manage to rise to the surface after so long, is it a case of cream on the surface of the milk? Edited by Beechwood, 05 September 2017 - 17:48.
well, since it has risen, and since I have an example of this brand, then here's another in a sort of green striated /marble - nib has an unusual shaped cartouche in which to display the carat, and some reasonable flex. The filigree cap band is attractive. In my two to three years of looking for pens, think this is the only example I've seen, so presumably less than common, although I've not gone out of my way to look for them. I would defer to northlodge's knowledge of f.ps., but judging by the quality of my 'UNIQUE', I'm unsure as to why they should have been below Platignum in the ebay pecking order - a brand where plastics shrunk, nibs were generally poor, and a bad smell was par for the course, often. Having said that, I have about sixty odd Platignum f.ps. but only one UNIQUE. That's a splendid pen and a fine example of the later Unique at its best, but there were some others around that were very poor quality. Like all the fountain pen manufacturers in the 1950's Unique were squeezed by Parker and Conway's at the upper end and the ball point at the bottom end of the market, so they concentrated on the school and cheap gifts market. They sold some appalling pens of the shrinking, banana plastic type, but they also imported some reasonable quality pens too. One of the owner's was alive a few years ago and might have been able to tell us when they stopped manufacturing in this country. Would like to see your Unique some time Paul. Ever thought of going to the Pen Geeks meetings? Edited by peterg, 05 September 2017 - 22:10. The specimen shown by PaulS would appear to confirm the suggestion that Unique manufactured the Eversharp Kingswood model marketed in the UK by the US company Wahl Eversharp. Edited by northlodge, 06 September 2017 - 07:18. I have no idea how the post got reserected Paul, as I only look at new posts. Anyway, no apologies as it teased out PaulS's photos! I think that is right Paul. During the war when the Kingswood was launched pens were made by various manufacturers but post war almost certainly only Unique. What I can't say is whether they were contracted by Unique, there was a lot of mutual assistance between the manufacturers to make the best use of supplies, or by Eversharp. There are claims that Parker's made them post war, but that is unlikely. At the time Parker were their major competitor and suing Wahl in the US over breaches of copyright on their ball pens, which subsequently brought them to bankruptcy and Parker's take over. too many Paul's here, obviously, Peter - get's confusing. No - I'd not really given any thought to the geeks meetings, which assume in London somewhere............. can you send me a pm and let me have some idea of dates etc., and although I can't guarantee making it, will give some serious thought to letting you see my UNIQUE. thanks. thanks - yes, I had assumed he was in that post.